Mr. William Bousman was awarded the Alexander A. Nikolsky Honorary Lectureship in 2011. The Lecture was delivered at the 67th AHS Annual Forum and Technology Display at the Virginia Beach Convention Center, Virginia Beach, VA on Tuesday, May 3, 2011, where Mr. Bousman was honored at FORUM 67 with the presentation of a certificate and a medallion. His lecture, titled “Full-Scale Airloads Measurements – Extraordinary Costs, Extraordinary Benefits” was featured in an edition of the Journal of the American Helicopter Society. The Lectureship is awarded to “an individual who has a highly distinguished career in vertical flight aircraft research and development and is skilled at communicating their technical knowledge and experience.” In winning the award, Mr. Bousman joins the ranks of previous distinguished Nikolsky recipients including Dr. David Peters, Dr. Ken Rosen, Troy Gaffey, Dr. Richard M. Carlson, Professor Howard C. Curtiss, Jr., Dr. Daniel P. Schrage, David Jenney, Evan Fradenburgh, Kenneth I. Grina, Robert R. Lynn, Rene Mouille, Professor Alfred Gessow, Bartram Kelley, Robert Huston, Bruno Lovera, Professor Barnes McCormick, Jr. and Dr. Wayne Johnson. Mr. Bousman has dedicated more than 40 years of his career to analyzing and understanding a number of critically important rotary wing aeromechanics phenomena. He has provided new and clear understanding of hingeless helicopter rotor aeroelastic stability, unsteady 3-D rotor aerodynamics, and dynamic stall by authoring more than 70 technical papers, reports and journal articles. He has understood and interpreted the lessons learned from model-scale/full-scale wind tunnel testing and flight test. He has led the technical discussion and dialog for the UH-60A Airloads Program (flight and wind tunnel) for the past 20 years. He has authored best papers at both the AHS International and the European Rotorcraft Forum. Mr. Bousman is internationally respected for his technical research and deep understanding of rotor aeromechanics. Mr. Bousman graduated from Cornell University with a B.S. in Mechanical Engineering in 1964. He enrolled in graduate school at MIT and examined supersonic gust loading in the Naval Supersonic Wind Tunnel at MIT under thesis advisor Eugene Covert. He received his S.M in Aeronautics from MIT in 1966. As a U.S. Army 2nd Lieutenant (Reserve Officer), Mr. Bousman was assigned to the Flight Standards Office, U.S. Army Aviation Systems Command (AVSCOM) in St. Louis, MO, in October 1966. He completed active duty in 1968 and remained in the Flight Standards Office as a civilian. He worked on qualification programs for the AH‐1G, CH‐47B and C, CH‐54B, and AH‐56A. During this period Mr. Bousman performed studies that became codified into the U.S. Army Hot Day Hover Criterion, combining climatology models and hover performance methodology. In 1970, Mr. Bousman transferred to the U.S. Army Aeronautical Laboratory at Moffett Field, CA. For the next 15 years, Mr. Bousman established himself as the world’s premier rotor dynamics experimentalist. Working closely in collaboration with Dr. Robert Ormiston and Dr. Dewey Hodges as his theoretical analysis counterparts during this period, Mr. Bousman established an unmatched record of unique experimental research projects into the dynamics and aerodynamics of hingeless helicopter rotor designs. His work quickly became the benchmark for validation of new blade structural dynamics models (i.e., Hodges and Dowell, CAMRAD, COPTER, and RDYNE). His small‐scale experimental research led to thefirst documentation of low frequency dynamic inflow states. The existence of these aerodynamic states had been hypothesized/predicted up to this point but never demonstrated. Mr. Bousman was the first to document the existence of the lowest dynamic inflow states (indirectly measured in the rotor dynamics) in his very carefully controlled hover testing of high hinge offset model rotors. Mr. Bousman’s research shifted to focus on rotor loads in the mid‐1980s. This included analysis of flight airloads measurements on the French Puma helicopter with advanced tip shapes. This research considered not only vibratory airload generation, but also the ability to predict specific aerodynamic phenomena with emerging blade and wake analysis models. He spent six months at ONERA in Paris, France, in 1986 looking at ways of estimating airloads from structural measurements. During this period Mr. Bousman also led the U.S. Army Integrated Technology Rotor Program as new helicopter rotor hub types were being proposed and designed by U.S. industry. In 1992, Mr. Bousman joined the NASA/Army UH‐60A Airloads Project Team at NASA Ames Research Center. This decision by Mr. Bousman, and re‐direction of his research focus, became a career‐defining moment for the second half of his technical career. The technical leadership demonstrated by Mr. Bousman inspired and motivated the entire Airloads Project Team of many junior, and mostly inexperienced, rotor test and research engineers. His patience, mentoring, and teaching were exactly what was needed at that moment within the NASA and Army Project Team. The resulting successful UH‐60A Airloads Project flight testing (1993 and 1994) and the wealth of test data, including the detailed airloads from the pressure‐instrumented blade with 242 dynamic transducers, is in consideration as the greatest contribution to rotorcraft aeromechanics in the past 30 years. Mr. Bousman’s analysis, understanding, and interpretation of the UH‐60A Airloads Program data clearly stands head and shoulders above all other helicopter experimental test programs since the early 1990s. His seminal papers, often with junior co‐authors, have described the complex, unsteady, three‐ dimensional aerodynamics of edgewise flying rotors at the very limits of the rotor operating capability. Two of these papers have been recognized by the Royal Aeronautics Society (Kufeld and Bousman, 1996) and the American Helicopter Society (Bousman, 1997) as the best papers presented at the American Helicopter Society. Following Mr. Bousman’s documentation and analysis efforts, others took up the challenge of attempting to mine the UH‐60A Airloads database and demonstrate the ability to accurately predict rotor dynamic airloading. The UH‐60A Airloads Working Group is indebted to Mr. Bousman for setting the stage and providing the understanding necessary to allow a large group of Government, U.S. industry, and academia researchers to dig even more deeply into the detailed rotor airloads as documented in the UH‐60A Airloads Project. This effort has led, since 2004, to the widely accepted fact that coupled computational fluid dynamics and computational structural dynamics is the future of rotary wing analysis and design. Mr. Bousman retired in January 2003. However, he has remained very active in his personal research and in supporting the UH‐60 Airloads Program as a U.S. Army Emeritus Scientist. He continues to be an active contributor to the UH‐60A Airloads Working Group. He has also been invaluable to the NASA and the U.S. Army in assisting in preparation, conduct, and initial data analysis of the 2010 UH‐60A Airloads Wind Tunnel Test in the 40‐ by 80‐Foot Wind Tunnel of the National Full‐Scale Aerodynamics Complex. His technical insight and judgment were critical to the formulation of the detailed wind tunnel test plans. Mr. Bousman also provided the Government “real‐time” assessment of data quality and data accuracy in this, the final phase of the UH-60A Airloads Program. Directors. 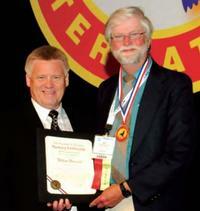 Mr. Bousman has served as Associate Editor and as Editor‐In‐Chief of the Journal of the American Helicopter Society. He was also the Technical Chairman of the 1984 Second Decennial Dynamics Specialists Conference.